The term Shell Shock was first mentioned by that name in a British medical journal in 1915. Initially, it was thought to be a physical injury to the brain from nearby explosions, but in 1916 the symptoms were recognized in soldiers who had not been near a significant blast. It is now understood to be both a physical or mental injury from war or another traumatizing experience. The description of symptoms of shell shock can be found in documents dating back to 400BC. Herodotus documented one soldier going blind from fright and another in a state of panic after a friend was lost in a war. Going even further back in history to the Bible, a description can be found of being fearful and fainthearted in war. PTSD is a human reaction to trauma and extreme fear. From the Bible to Herodotus and up to the present day, extreme fear manifests in a physical and/or a mental reaction. Symptoms include trembling, headache, tinnitus, poor concentration, confusion, sleep disorders and loss of memory. PTSD also manifests as feelings of suffocation, being upset by sudden noise, visualizations of horrors seen in war or trauma, feeling the terror of heavy fire, easily angered and the potential to engage in a reckless or self-destructive behavior. Veterans who make it home are overlooked victims of the very wars they went to fight. The mental trauma from the war sometimes doesn’t even start until they make it home. They are far from the war, yet they are not out of the war. No one around them sees it. That is unless they are the few who “engage in reckless or self-destructive behavior”, they snap. Is everyone with PTSD going to “snap?” No. But can PTSD be associated with those who have committed some of the recent mass shootings? In the first eleven months of 2018, there have been eleven mass shootings. Of those, two were committed by veterans of the ongoing war in Afghanistan. In 2017 there were also eleven mass shootings, two by veterans of wars. PTSD is a mental disability caused by extreme trauma such as war. Mass shootings are not committed by mentally stable people. Soldiers are not the only ones with PTSD. Many traumatizing events can cause PTSD of varying degrees. A severe injury or death of a close family member, violent sexual assaults and natural disasters have also been linked to PTSD. A violent world and culture leads to more violence. Could those who committed the rest of the mass shootings also have suffered from PTSD? Did they experience a trauma of some kind that caused them to carry out such a destructive behavior? After a mass shooting, there is an immediate outcry for greater gun control. But instead of focusing the discussion on the weapon, ask why is a person trying to kill people in the first place? What is at the root of this reckless and self-destructive behavior? 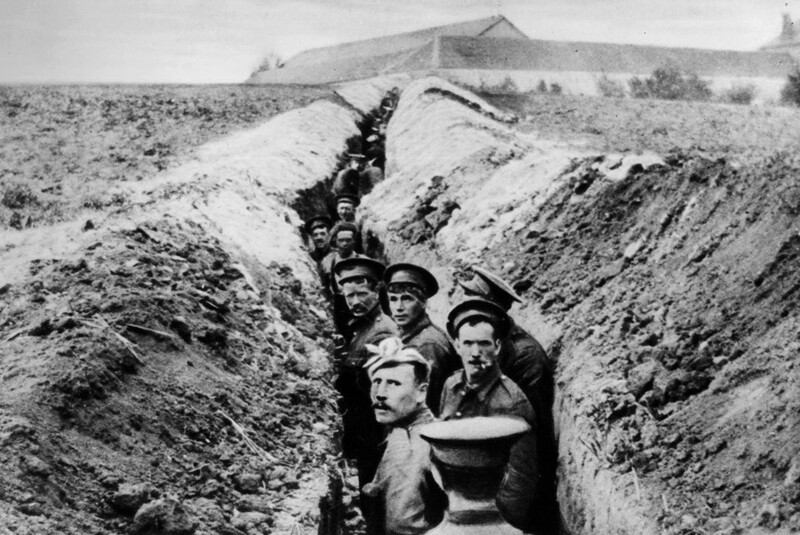 World War I ended in 1918, yet since then, millions more have been killed in the wars. So what did World War I do? It didn’t end all future wars. It wasn’t the “war to end all wars”, and neither was the next one or the next one. There is much more going on with what seems to be a never-ending culture of war and violence. There are no acceptable consequences of war. From the innocent civilians to the soldiers with PTSD, all are victims. Step back from the soldiers and look at the leaders directing the wars. They increase the military budget year after year, while at the same time spouting “God Bless America” at every opportunity. Will God bless a violent nation? If God was blessing America, why would we need to fight in wars and own so many guns? God hates war and those who promote it, profit from it and send millions to die in it. The consequence of war is a curse from God, not a blessing. It is the reason God destroyed the earth the first time. Those who have put millions in harm’s way and caused civilians and soldiers alike to be terrorized to the point of “shell shock” or PTSD are not in the clear. There will come a time when “men’s hearts will fail them out of fear.” But this will not be the fear of war between men, it will be the fear of God. How appropriate that those who have caused men’s hearts to fail from fear of the wars of men, will, in fact, have their own hearts fail from the fear of God.